domed: 1. Cover with a dome. 2. To headshot someone in a video game, like a first person shooter. In response to the grave status of the coho salmon population in Northern California's Russian River a broodstock program has been underway for the last decade. To jumpstart the program, the California Department of Fish and Game (CDFG) collected juvenile coho native to the watershed and placed them in the Warm Springs Hatchery below Lake Sonoma. These juveniles were reared to adults. These adults live out the remaining years in the domed pools pictured below. These adults represent the future runs of coho for this river. When the three year timer goes off, the captive fish are spawned and their offspring released throughout the Russian River watershed. The first offspring from this program were released in the fall of 2004. Brett Wilson, the CDFG fish hatchery manager at Warm Springs, stated "Raising captive wild salmon means that these fish will spend their entire lives in fresh water, without the migration to salt water stage of their life cycle. For DFG this is very different from raising production fish for mitigation, enhancement, or a put and take fisheries." The facilities at Warm Springs were designed especially for raising coho. 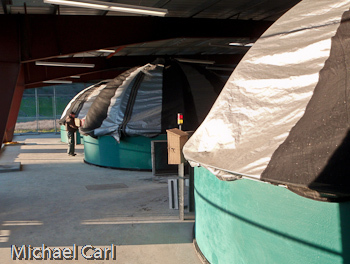 Wilson stated, "When raising the captive wild salmon, DFG use circular tanks which allow hatcheries to maintain much deeper water and a strong current. This is to mimic as much as possible the ocean environment to minimize stress on the fish and to maintain low densities. All of these factors are very important for egg development in captive salmon."